Hands on: Samsung ATIV Q review | What Hi-Fi? The Samsung ATIV Q was arguably the highlight of the Samsung Premiere 2013 event at London’s Earls Court, where Samsung launched a whole of new smartphones and tablets. 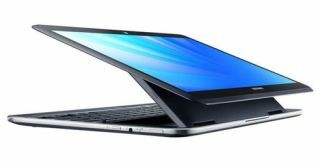 Tthe Samsung ATIV Q is a tablet unlike any other, with a shape-shifting design – making it a notebook laptop and a tablet – and the ability to run Windows 8 and Android operating systems. At first glance the ATIV Q is just a massive tablet, packing a laptop-sized 13.3in qHD+ display with a whopping 3200x1800 resolution. Push the screen up and you’ll find a full keyboard, complete with a tiny trackpad and mouse buttons. You can keep it as a tablet, use it like a laptop, or flip the screen over and use the keyboard as a stand. Using the keyboard feels comfortable and natural: the keys are flatter than on a laptop but better spaced out than a notebook. Also making an appearance is the Galaxy Note’s S Pen aka stylus, which provides an accurate way to prod at the screen. Despite its shape-shifting design, the ATIV Q is more tablet than laptop. At 13.9mm thin and 1.3kg, it’s surprisingly comfortable to hold. That’s impressive considering its sturdy magnesium and plastic construction, which contains a Haswell Core i5 CPU, 256GB solid-state drive, 4GB of RAM and a battery that supposedly lasts 12 hours. It also has a decent number and variety of connections: two USB ports; Bluetooth 4.0, wi-fi; ethernet; micro-HDMI and a microSD card slot. The headline feature is the Dual OS mode, which makes the ATIV Q a truly versatile device. It runs Windows 8 and Android 4.2 simultaneously, flipping seamlessly between the two if you want to play Angry Birds halfway through a spreadsheet. And, unlike the Microsoft Surface RT, this is the full version of Windows 8 so you can run all the normal MS software such as Word. Android 4.2 runs as an emulation, however, essentially acting as an app within Windows 8, so we’ll have to see if it offers the full Android experience. From what we saw, it works very well, slickly moving from one OS to the other and seeming to offer plenty of functionality. No price or date has been announced yet, so we've yet to decide if this do-it-all piece of hardware is going to be a worthwhile investment. For now, its safe to say that it’s an innovative and exciting piece of kit.